Deliveries from a school uniform supplier that serves over 5,000 schools and academies across the UK have been delayed by a “technical glitch”, leaving parents and their children in the lurch with no uniforms for the first day of the new school term. The Twitter account for School Trends has been inundated with complaints in the last week, after the company tweeted that “due to a technical glitch some orders have been delayed”. Customers have also been sent an email, seen by Schools Week, informing them that “a technical problem that occurred between School Trends and one of our external service providers” has meant that “all remaining items” will be “despatched by 7th September and no later than Monday 10th September”. Meanwhile, many schools will start the new academic year next week. Today the company, which promises “a great service where you order online” on its website, was forced to suspend its social media interactions “until further notice”, as worried parents flooded the feed with concerns about the delays. School Trends are doing everything we can to ensure customers receive their orders as soon as possible. Therefore, we have taken the decision to cease monitoring & responding to social media until further notice. This allows us to fully prioritise all outstanding orders. Thanks. 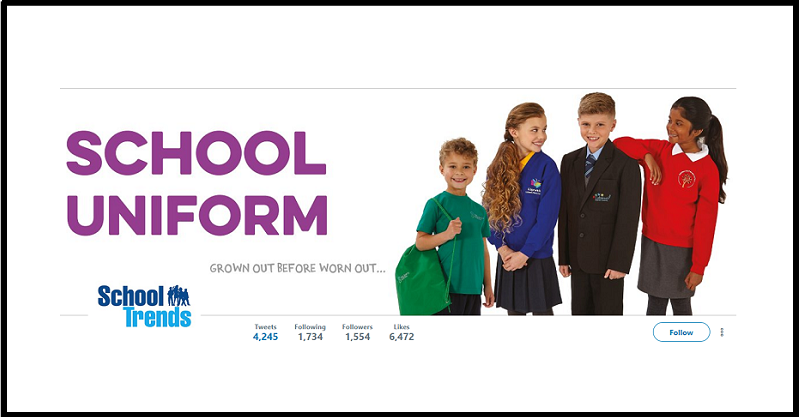 Chris Price, a parent in Hereford, told Schools Week that he placed and paid for an order for his son’s new uniform for his first year of primary school on July 12th, but has still not received the items. He said he “wanted to do it early” to make sure if there was time to change the clothes if the the sizes were wrong, so had been careful to allow for the 21 days delivery time specificed on the School Trends website for the busy summer months. When the 21 days had passed he said he called the company and was told there was “a delay in production” but he would receive his order by the end of the week. This did not happen and despite “numerous phone calls” he was not provided with clear information about what was happening, he claimed. Today he said he was told by School Trends that the company does not know where his order is and will therefore be issuing him with a new one, meaning it will not arrive in time for his son’s first day at Holmer Primary School. “I have had to try and source alternatives, leaving me further out of pocket to replace something I have paid for and not received,” Chris said. School Trends has been approached for comment. A spokesperson for school leaders union the NAHT told Schools Week the hope is that schools will be supportive of parents and pupils who have been affected by the School Trends’ delays through no fault of their own. “On the first day of school everyone needs to get off on the right foot with each other. This kind of confusion definitely won’t help some families. It’s a stressful first day anyway and this is causing extra anxiety. Another parent who wished to remain anonymous claimed they had waited 27 days for new uniform items for a child who is going into year 6. They said it was their third year ordering from School Trends, which is the sole provider of the uniform for their child’s school in Surrey. “Luckily I have some uniform from last year we can use but I imagine it would be hard for some people to replace the clothes in time for school,” they said. They added that they “feel very sorry for the parents of children heading into reception, as it’s always such a big moment having your photo taken on their first day of school”, but some may not have their uniform in time. Such a ‘glitch’ could easily be avoided if schools didn’t insist on personalised uniform items from a sole supplier but just gave a colour (say navy) and let parents decide where to buy uniforms from. Badges could be sewn on to items such as blazers but it’s not necessary to have most items carrying a logo. This is due to a company over-expanding and not being able to meet demand. The communication and attitude towards parents and upset children is shocking. However, schools have allowed this to happen. If schools didn’t insist on expensive logo tops and tell you to order all uniform through an online supplier then this wouldn’t happen. At one point in the noughties schools needed to justify logos or uniforms that couldn’t be picked up from a supermarket or department school which meant everyone was in the same coloured jumper or blazer and there was no excuse for not having uniform at the start of term. Well so much for “no later than 10th September”. Is the 22 Nd today and STILL NO ITEM, despite the last contact stating that it would be delivered by 21st. Not even a courtesy email or contact made either. It’s despicable and I smell a rat. I had shipped here for school uniform for many years previously but NEVER again! We are still waiting for main part of the uniform . Order has been placed on 16.08.18.